Does anyone else love gorgeous antiques with stunning detail? This. Girl. Does. 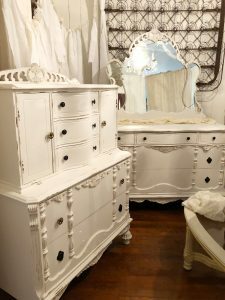 I found the most beautiful dresser and chest set. I bought this set for my vintage Business Classic Cottage Co. It was one of the most challenging Classic Cottage projects yet but totally worth it. 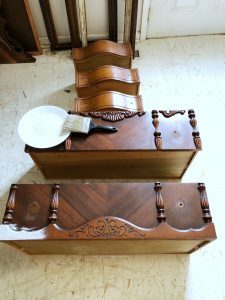 This set was gorgeous when we found it but needed a little TLC to make it usable again. 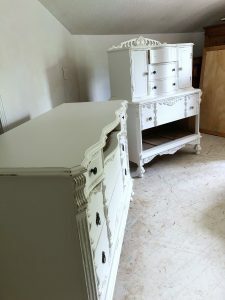 Aaron spent hours fixing drawers and other little details on each piece. I bought this set in such excitement I didn’t even realize some of the drawers didn’t work properly. Yikes!! Thank goodness Aaron knows a little woodworking! Time for the big transformation. The white paint!! I went with a clean crisp bright white paint to make this set pop. Since it has a lighter color, you can see each little detail. Sometimes I feel bad about painting antiques but this was a good decision. Aaron and I both agreed this set deserved the very best. We spent extra time and you can totally see that it was time well spent. I’m so glad I went into a thrift store and spotted it a few weeks ago. Hope this post inspires you!! PS – This set is located in Classic Cottage Co. at The French Flamingo in Opelika. This is absolutely beautiful!! I’m so glad y’all saved them! !